We tend to think of ginseng primarily as a Chinese herb, however American ginseng is just as valuable and in some cases more suitable. American ginseng is a "cooler" alternative to Chinese (also known as red or Korean) ginseng (Panax ginseng) for persons who have high blood pressure or for treatment during summer months. Preparation Methods & Dosage : Ginseng is often taken for a month at a time, alternating with a two week rest period. Ginseng powder can be taken in teas, added to other soft drinks, or even used in cooking soups. 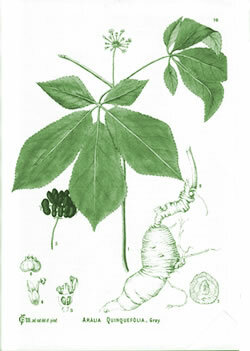 Ginseng roots are also used as extracts, and in capsule supplements. Traditional Chinese Medicine In Chinese traditions, American ginseng is considered to be more yin, helping to reduce the heat of the respiratory and digestive systems. 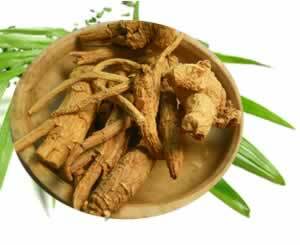 American Ginseng Side Effects: Do not use during pregnancy. Consult with a health professional before self treating if you have high blood pressure. American Ginseng, whole plant, Pa. 1885,Millspaugh, Charles F.
Flowers:Scented yellow-green flowers. The fruits, which follow the blossoms, are two-seeded red berries. Root: Large fleshy root - part used medicinally. A good-quality root has first a sweet and then a bitter flavor as it is chewed. Distribution:American ginseng is found from Maine to Georgia and from Oklahoma to Minnesota. Unfortunately, it is now an endangered species in much of this area. Asians highly value the ginseng grown in Wisconsin. A heavy concentration of ginseng was once found in the Appalachian mountains, in fact plant geographers have recognized a phenomena know as the "disjunct eastern Asiatic-eastern North American range. American ginseng, Panax quinquefolium,is on the United Plant Savers "At Risk" list. Wildcraft this plant responsibly. Ginsengs uses are legendary, and its lore springs from ancient times in China, as well as Native American folklore in North America.